DEAL ISLAND, Md. — The ghost forest is creeping into Deal Island. Stands of tall pines stick out like pale arboreal skeletons throughout the marsh on this island lashed by the Chesapeake Bay. The trees are dying farther and farther inland as salt water poisons the soil, an ominous sign that the rising sea is reclaiming this land. Some on the island and the peninsula that connects it to eastern Maryland can trace their ancestry back 300 years or more. But rising sea levels, connected to climate change as well as land sinking since the last ice age, have steadily consumed Deal Island as their kin are born and buried. Old-timers speak of plucking buckets of arrowheads from beaches that now lie underneath the bay. Scientists are concerned that the ghost forests are a sign that within the next generation or so, parts of the island will become uninhabitable. Much more, they say, could be subjected to flooding so frequent it would make living here almost impossible. Deal Island is on the front lines of climate change. Even under the rosiest scenarios, in which sea levels rise only 2 feet by 2100, much of the island will be underwater in a few generations. Rising global temperatures are expected to wipe out businesses, marinas and homes. Still, climate change isn't a popular phrase here. 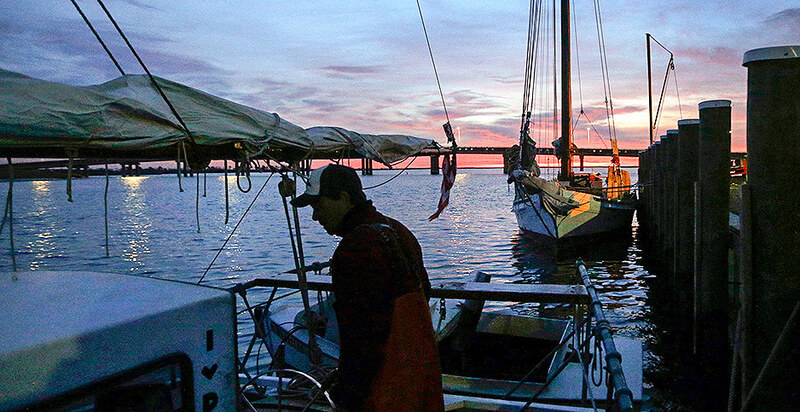 Many of those whose families have scraped out a living, largely through the bay's bounty of crabs and oysters, attribute the retreating ground to erosion, or "land loss." "Some of the arguments are a little silly," said Stephen White, a longtime resident of the region. "We have climate change four times a year. I'm concerned about erosion." In some sense, Deal Island, a three-hour drive from Washington, is a microcosm of America today. This is Trump country, and many of those who live here are deeply rooted in Methodist faith, are politically conservative and are wary of outsiders or government restrictions on their way of life. It's just across the bay from Tangier Island, the mayor of which received a surprise call from President Trump this week. Trump told him not to worry about rising sea levels because the island is going to be there "for a long time." Scientists say Tangier Island is in a far more precarious position than that and could be uninhabitable two or three decades from now. And yet one relatively modest effort may offer a glimmer of hope for a divided country. The residents here need a climate policy that prepares their most vulnerable people for the flooded future that scientists say is on the way. It could happen within the lifetimes of these islanders, or some of them. On Deal Island, climate skeptics, anthropologists, crabbers, pastors and scientists have spent the last five years trying to figure out where they can find common ground. Led by social scientists from the University of Maryland, and partially funded by a National Oceanic and Atmospheric Administration sea grant, which is targeted for elimination in the president's budget proposal, they are talking about mitigation, restoring shorelines, building better drainage ditches and constructing bulkheads to hold back the damaging effect of waves. People often live in places like Deal Island to be independent, to be free from government oversight and anything that encroaches on their liberty, said Katherine "Jo" Johnson, a University of Maryland researcher who helps run the project. Still, she said the community will not be able to handle all of the changes coming in the near future — not on its own. For some things, like repeatedly rebuilding roads, it will need the government. Researchers were drawn to the area initially because there has been little effort here to prepare for the changes. She said one of the issues the group is wrestling with is whether it's even appropriate to ask people today to plan for the year 2100, if it means leaving their homes or taking on additional expenses. "You have to ask yourself, is it appropriate?" she said. "But then you have to get into questions of who decides and what are we planning for and when do we plan for that. So asking everybody out here to give up their land and their livelihood because one day it would be inundated, if you think about it that way, that's crazy, that's crazy to ask them that." 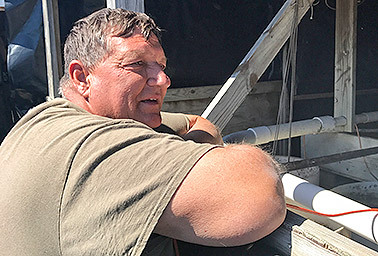 David Webster, a fifth-generation waterman on Deal Island who traces his roots here to the 17th century, has noticed the changes and recognizes that climate change could have some role. Still, he said the first settlers here recognized they wouldn't be able to stay forever. On a recent day, as he surveyed the construction of holding tanks for the latest catch of soft-shell crabs, he said he plans to remain in the area until he can't anymore. Webster, who is also a Methodist pastor and has mentioned climate change from the pulpit on Sunday morning, said the hardest work is not having conversations about climate change. It's the next step. It's finding a solution that works for everyone. "It's where to take the next step, because that's the problem, because if it goes on the side of this group that thinks that, well, sea-level rise means we need to change everything we're doing and we do those things, or if it goes on our side, to where we say, 'Let God take care of it,' they'll be upset," he said. "It's the next step that causes the problem. The talking isn't the problem." Climate change or erosion? Does it matter? Worrying about climate change can almost seem like a luxury for many of those just trying to eke out a living in the poorest county in one of the nation's wealthiest states. But it's impossible not to notice the rising seas on Deal Island. High tides, even on sunny days, can make roads impassable for the school bus. Some residents who leave for work can't get home at night when their streets are inundated. Cemeteries have been swamped, the salt water eating through the concrete structures that house the coffins, exposing the skulls of those who carved out a living from the marsh and dunes. Some houses, in areas that flood frequently, have already been abandoned. The Chesapeake Bay has already lost 13 islands to rising waters. Sea levels in the bay rose a foot in the last century. That's twice the global average, and it could rise 2 feet by 2050, according to researchers at the University of Maryland. The rising sea levels of the Chesapeake are due to a combination of factors, two of which are related to climate change. The first is that the Atlantic coast is seeing some of the highest increase in global sea-level rise. In addition, as the bay water warms, it is expanding. The land is also sinking after shrinking glaciers in the last ice age caused it to pop up, like a seesaw. "There are some unique areas, the Chesapeake being one of them, that due to their historically high rate of sea-level rise are feeling the consequences more so than many other areas in our country, maybe outside of Louisiana, and with their high population density, it's really noticeable," said William Sweet, an oceanographer at NOAA. One of the vanished islands belonged to White, a former Methodist minister who tried for decades to save Holland Island, which was once 3 miles long and home to about 400. But humans can only hold angry waves at bay for so long. And in 2010, the last remaining part of the island lost a house that was built around 1890. It was swallowed by the sea, and Holland Island became part of the Chesapeake Bay. Still, White is unconvinced that climate change is a culprit. He spoke of Holland Island in hushed tones, perhaps reserved for the death of a loved one. Like many on Deal Island, he frets about land loss but doesn't think the ocean is rising. White spoke to a reporter amid the boarded-up ruins of his next project — preserving the remains of a Civil War-era church. White, 86, stood among graves dug and capped with concrete in a drier time that are now collapsing into the salty broth of the marsh, revealing glimpses of skeletal remains inside. White believes it's the result of natural erosion. Erosion, land loss or climate change, the only thing that really matters is that another foot of sea-level rise, which scientist say is possible in just 30 years, means Deal Island will become further separated from the mainland, as the marshes that surround it are overtaken by the Chesapeake. And while areas of the island are high enough to withstand even 5 feet of sea-level rise, the roads into the island could be nearly impossible to maintain. For people whose families have made a living from the sea for generations, with its boom-and-bust cycles of crabs and oysters, climate science sounds like something an outsider would use to restrict their way of life, said Michael Paolisso, an anthropologist at the University of Maryland who has worked with residents for about 20 years. "Where they resist the most is when science comes in and monopolizes the discourse on it and makes some projections about what the future is going to look like for them, and those projections have real-life implications for them," he said. It's not as impossible as it sounds, perhaps. One solution could be found in Salisbury, about 45 minutes down the road, where Mayor Jake Day is grappling with how to prepare his city of 35,000 for the effects of climate change. Salisbury experienced a 1,000-year flood last year, when parts of the city were inundated. Apartment buildings flooded. Day, who has a master's degree in environmental policy from Oxford University, knows more flooding is coming. 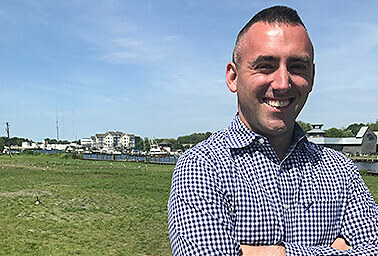 Yet he is tasked with running the largest city on the Eastern Shore, a conservative area where about half the residents think humans are causing global warming and only 40 percent think global warming will harm them personally, according to a survey from the Yale University Program on Climate Change Communication. The national political debate can shrink to irrelevance at the local level, Day said. Political leaders often don't even have to do much explaining about why they need to make expensive infrastructure upgrades to handle more extreme weather events, because the evidence is usually in front of people, he said. They've already seen the evidence. It's what happens when their houses, and those of their neighbors, get flooded. They've seen Main Street inundated. "It's always important to take it back to that individual experience and say, 'Forget the political debate, forget the national debate, forget the debate about the science; think about what you're seeing right here. You've got to do something about it, and you've elected us to make decisions; you've elected me to make decisions, so I've got to do something about it.' And then when you get into specific projects, it all makes sense to people," Day said. People on the Eastern Shore are particularly attuned to the effects of climate change, even if they use different terminologies, because they live between the bay and ocean and recognize how it could alter their livelihood, said Sen. Ben Cardin (D-Md.). The solution to addressing climate change is to develop an energy policy, one centered on lowering carbon emissions and increasing renewable energy and green jobs, he said. "The way we deal with excessive carbon emissions also helps us with a smart energy policy and with more jobs, so I think we can sell this without challenging their belief on climate or how much we can affect climate by our activities, even though the science is clear on that," he said. "The policies themselves are popular. I don't avoid using climate change; I talk about it all the time. But in order to get broader support, we may have to use different ways of presenting it. We never want this to be a partisan issue. It's not a partisan issue." In the meantime, construction of newer — and stronger — homes continues apace. On a recent day, David Albert lugged a load of wood into the shell of a 1,200-square-foot, three-bedroom house. It's replacing one damaged by Superstorm Sandy five years ago. To him and others, the job boom is an appealing byproduct of the damaging storm. "They're worried about their job more than they're worried about climate change," he said. Correction: An earlier version of this story misspelled the name of University of Maryland researcher Katherine "Jo" Johnson.